Low raw material prices could lead to another strong year in 2016. What: Shares of Dean Foods Co (NYSE:DF) jumped an impressive 16.5% in January according to S&P Capital IQ data as investors bet operating conditions would improve in 2016. So what: Low milk prices for Dean Foods' inputs haven't been offset by lower prices for customers, which should lead to higher margins this year. That was also part of the thesis presented by analysts at Stephens, who upgraded the stock to an overweight rating and added a $22 price target. 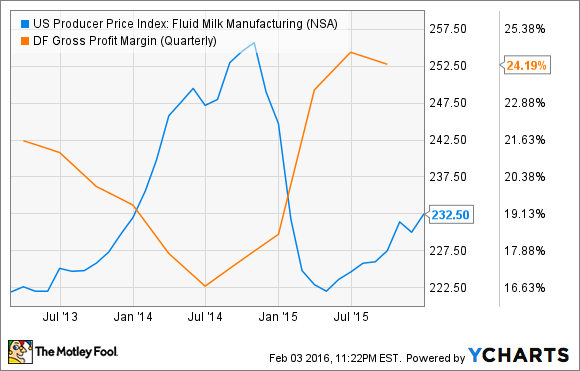 Now what: You can see the correlation between milk prices and Dean Foods' margins in the chart below. As it stands right now, it looks like profits will remain strong, because end customer prices haven't come down too far. The short-term indicators look strong for Dean Foods, but keep in mind the stock can swing wildly with milk prices, both as a raw material and what it can charge customers. The good news in January could go bad by the end of 2016.